Nina Ottosson Maze Cat Toy Review - Is It A Good Treat Dispensing Toy? (3.5/5)The Nina Ottosson treat maze is a brightly colored and fun interactive treat toy dispenser that gives your cat a fun meal time, making your feline work to get its treats by wobbling, rocking and spinning the toy. Inside the Nina Ottosson toy there is a complex maze structure where treats or kibble need to pass through to fall out from it. This treat dispenser toy is an excellent way to stimulate cats of all ages and sizes, not only physically but intellectually as well. Nina Ottosson Maze toy allows cats to spend their energy by batting and pawing at the toy, providing an excellent way to make cats active and with a sense of rewarding after working so hard to get the treats. Also, cats need to figure out the best way to move the toy in order for it to release the treats and this intellectual stimulation keeps them entertained and happy. It’s important to combat boredom in indoor cats because inactive bored cats for too long could lead to feline depression. Nina Ottosson Treat maze is made with tough, non toxic and durable plastic. 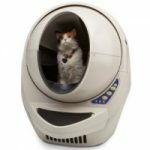 HOW DOES NINA OTTOSSON CAT TREAT MAZE WORK? The Nina Ottosson Cat Treat Maze has been designed for your cat to bat at the disk and move it so that it wobbles and spins around making the treats to drop out from the side openings. You can put treats in the top opening, on the sides or all compartments as well, depending on how much challenge you want for your cat. To increase the difficulty level, you can place a piece of paper towel in one of the holes of both top and bottom so that treats fall out only from one opening per side. 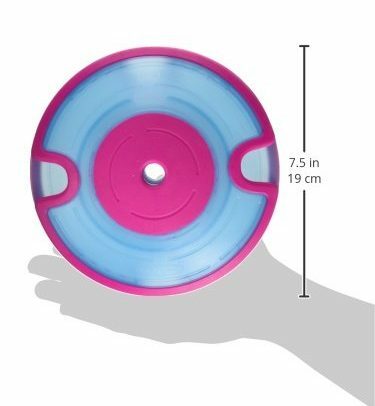 As your cat practices, it will get the hang of how to spin the disk to make it release the treats. Nina Ottosson Cat Treat Maze is made with durable no toxic and dishwasher safe plastic. As a safety measure, the toy does not have any sharp edges. The difficulty level of the Nina Ottosson Maze is Medium, so you may want to get this toy if your cat has previous experience using other less challenging toys. Some cats may not need to have experience with other toys and start playing right away with this unit, but this is most likely if your feline friend is very determined to get treats or kibble from the toy. This is something you won’t know until you get the Nina Ottoson Maze. 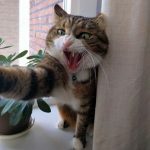 WHAT TECHNIQUES CAN CATS USE TO GET THE TREATS? Cats can make this toy work in different ways. While some cats bat at this toy hard against a wall or something like that, others just make sure to wobbly this toy by pawing at it or shake it until they see the treats to come out. Some cats discover they can flip the toy over to get treats to come out. 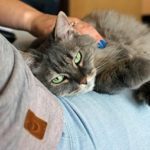 Whatever the technique the cat uses, it will help him to develop a strategy which makes cats feel better, stimulating their minds. Treat toy dispenser that keeps your cat mentally stimulated. Internal maze structure inside the toy that makes treats release by spinning it. Playing with this toy your pet increases its activity level. 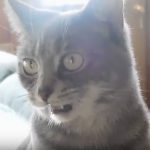 It is not easy for cats to get the treats to fall out from the toy. Use small treats because the opening is small. You have to use dry treats with this toy. 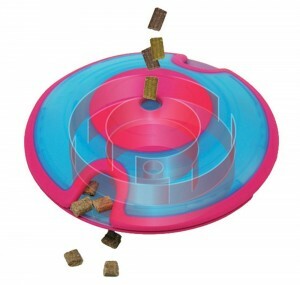 Nina Ottosson cat treat maze toy dispenser is a great toy if you want to make your cat really work for its treats. You have to use small treats with this toy dispenser otherwise it won’t dispense treats easily and the toy may not work well. The game ideally has to be supervised. 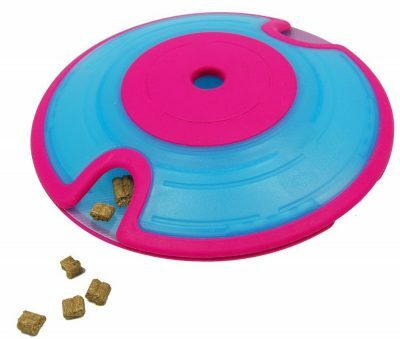 The cat needs to move the disk a little strong for the treats to get released, whether pawing at it strongly or playing hard with it to make it spin and release the treats. 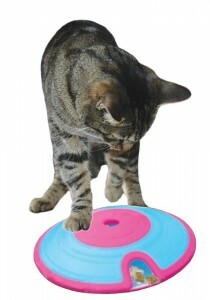 Nina Ottosson cat treat maze toy dispenser is a medium level difficult toy for cats. Nina Ottosson treat maze is a cool toy, but its success will depend on your cat. Your feline friend may love it or ignore it after one try. All in all, I recommend this interactive treat toy dispenser for a very food motivated and smart cat that does not give up easily.